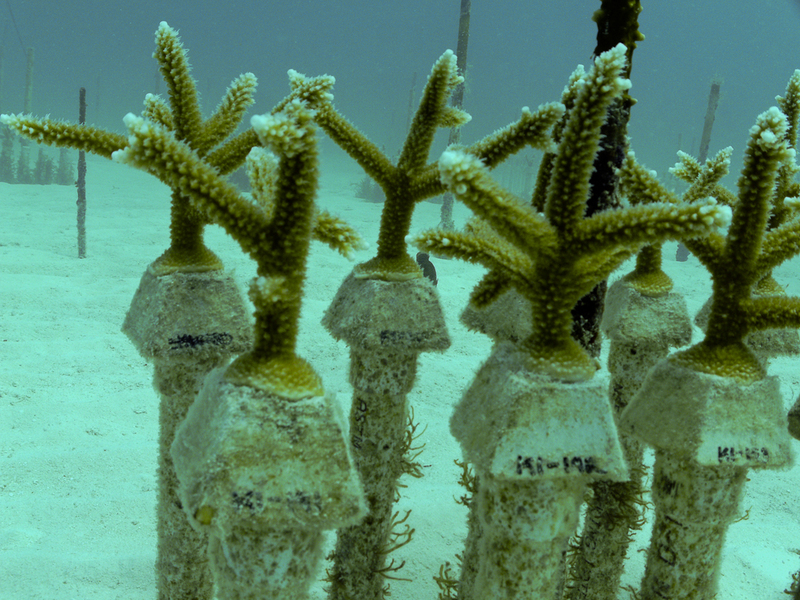 In January of 2011 I adopted some coral as a way to support the Coral Restoration Foundation. When I heard they were having a coral restoration dive on Earth Day (April 22) I quickly signed up. 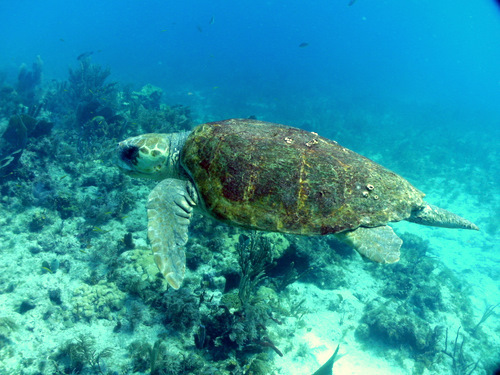 The event was made possible by a partnership between Ecokeys, Rainbow Reef and the Coral Restoration Foundation. We started out the day at the Rainbow Reef Dive Shop with presentation by Kevin from the Coral Restoration Foundation. I learned more detail about their nursery operation and growing techniques.I also learned about the plight of the long-spined sea urchin and impact their near extinction had on the reef. 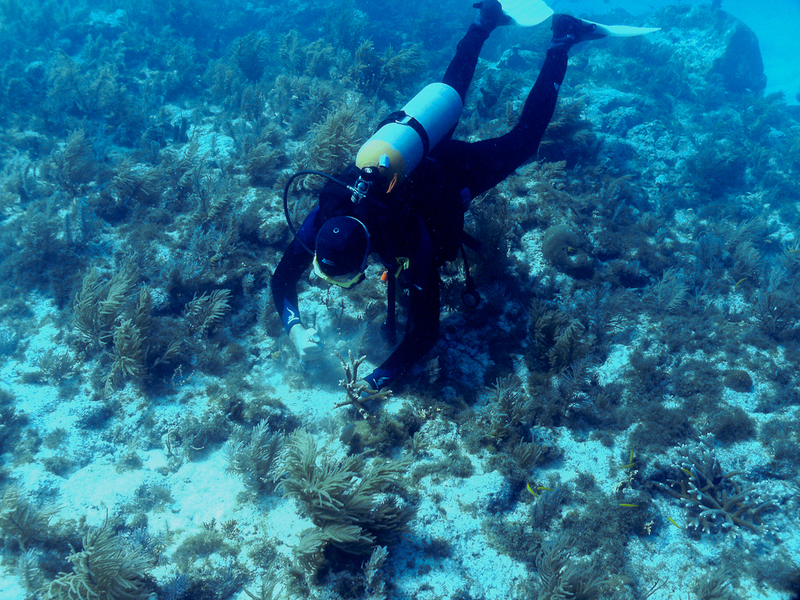 A mass die-off in 1983 wiped out nearly all long-spined sea urchins in the Caribbean and Florida Keys. They are experimenting with several different types of growing methods. They have both a “cap and pipe” system and line system. The PVC pipes and pipe caps can be gently twisted off for manual cleaning with a wire or plastic brush. 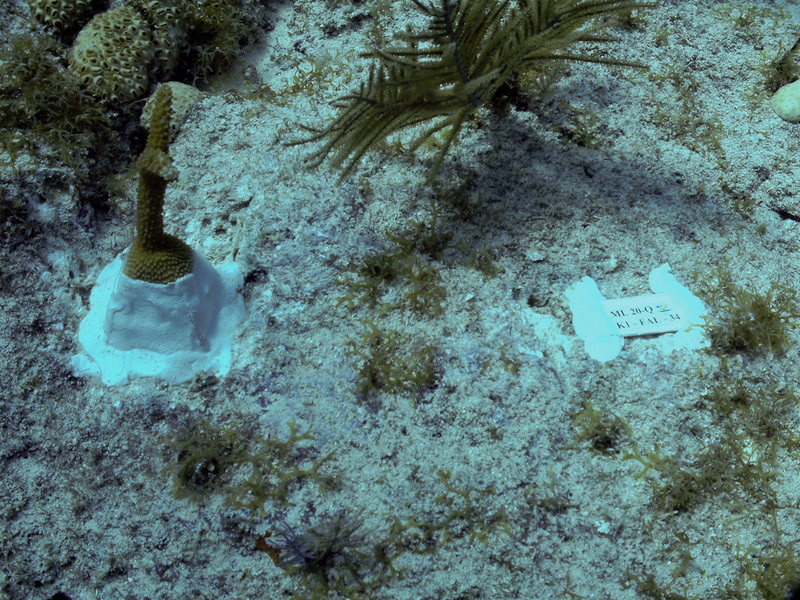 They have discovered the line allows the coral clippings and nubs to grow the fastest. After watching Ken work the line I realized it took more diving skill to work on a line system. I was impressed with the number of fish that had taken up residence in the coral nursery. 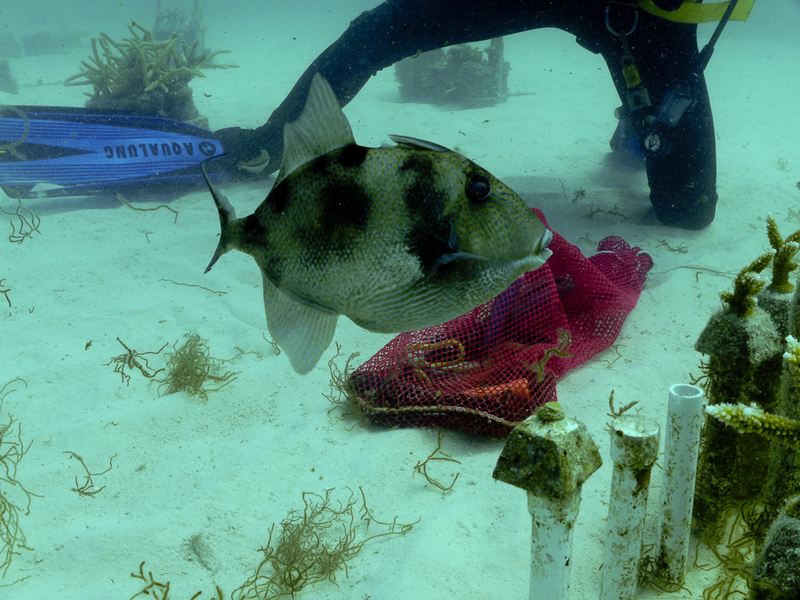 There was one Triggerfish that got a little aggressive while we were cleaning the coral. 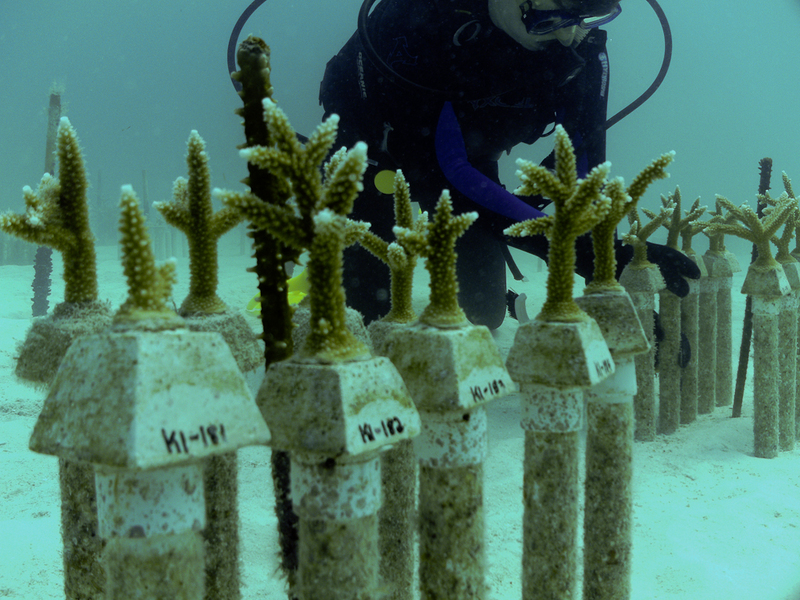 I was happy to see the Coral Restoration Foundation experimenting with growing Brain and Star Coral. It takes a lot longer to grow but its good to know it can be done. 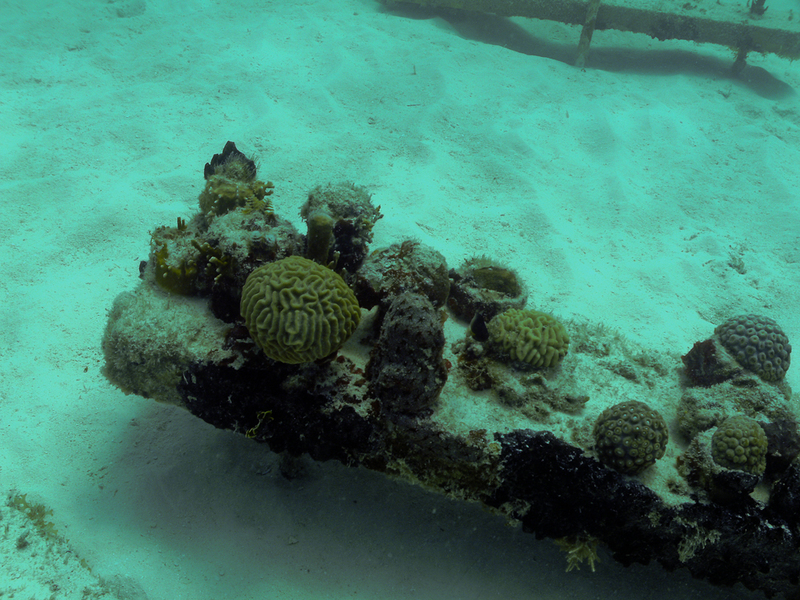 The next dive was at the Wellwood Restoration Site on Molasses Reef. 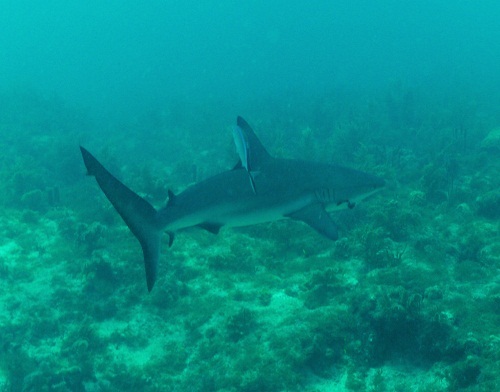 I had been there on Wednesday where I had seen the Black Tip Reef shark. 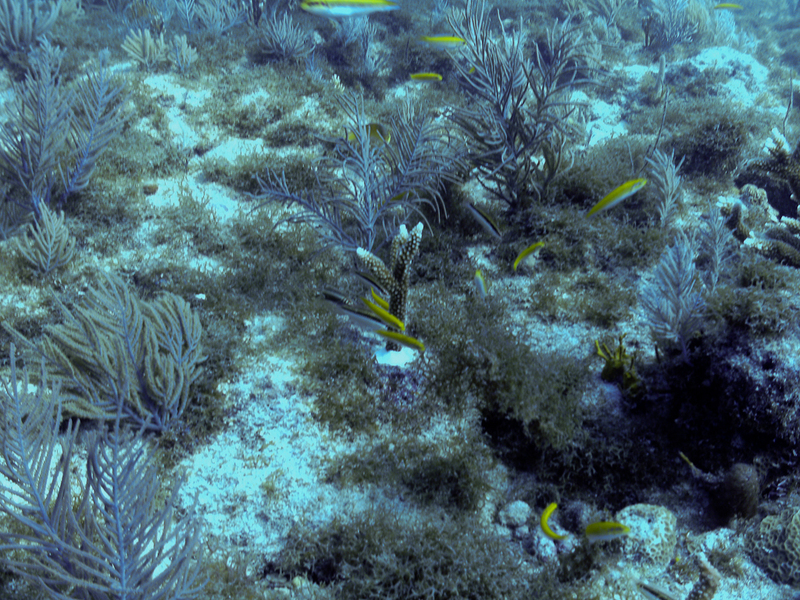 I was amazed how the juvenile Bluehead Wrasse (the small yellow fish) swarmed around the newly planted coral. 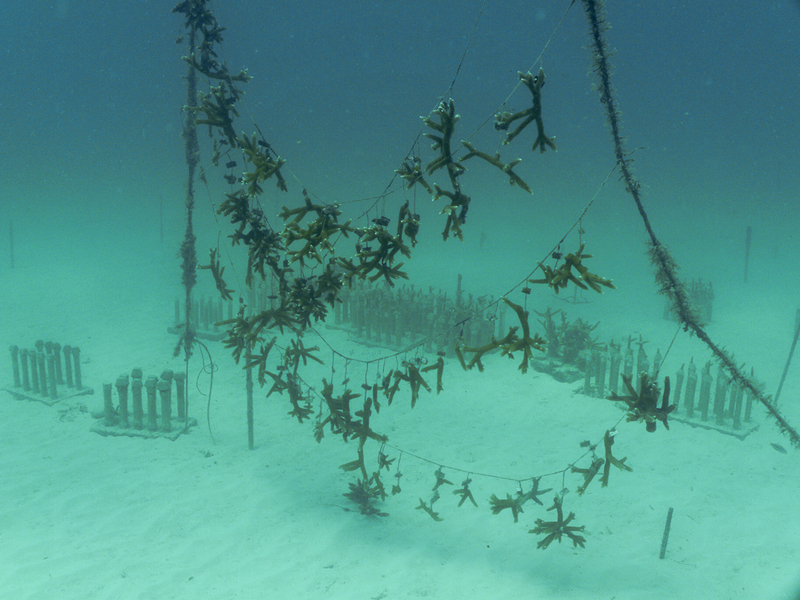 This trip we were just quickly re-planting clippings from other corals in the area. 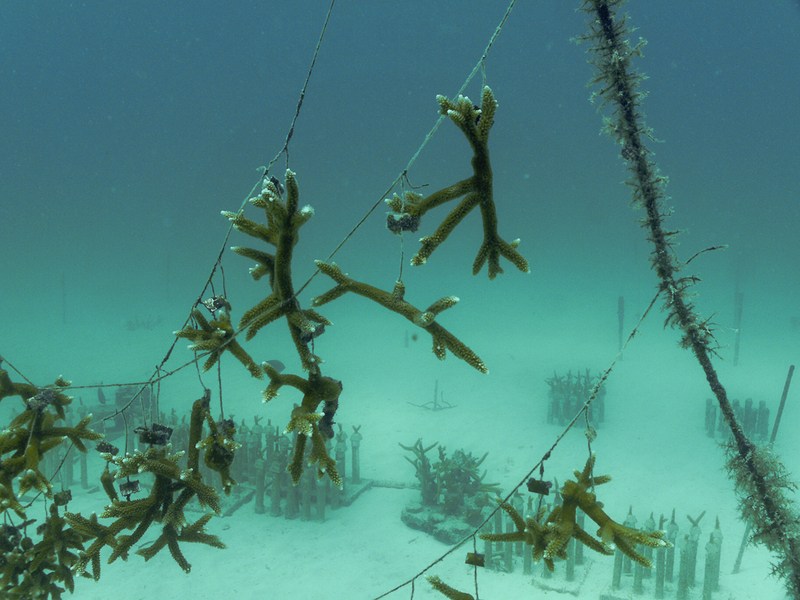 Normally they are placing coral with bases from the nursery onto the reef floor. I noticed several while diving at other sites on Molasses Reef. They recently started moving the ID tags off to one side since coral several years old have “bushed” out to cover the base tag. Before my next volunteer opportunity I would like to work on some different clip systems to attach tools to my BC so that I am more efficient. Thanks to a Facebook post by the good people at Rainbow Reef Dive Center, I learned about the Coral Restoration Foundation (CRF). I was happy to learn that Rainbow Reef has taken an active partnership role with the Coral Reef Foundation. 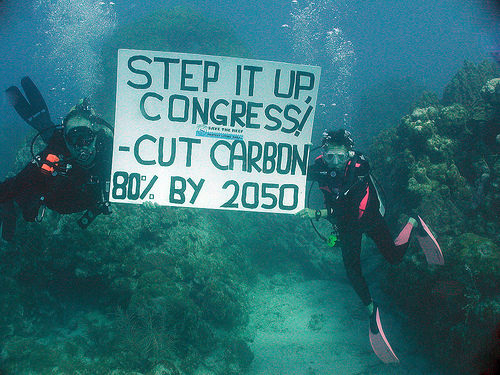 I like the concept of coral restoration because it is direct action to address the degrading coral reefs in the Florida Keys. 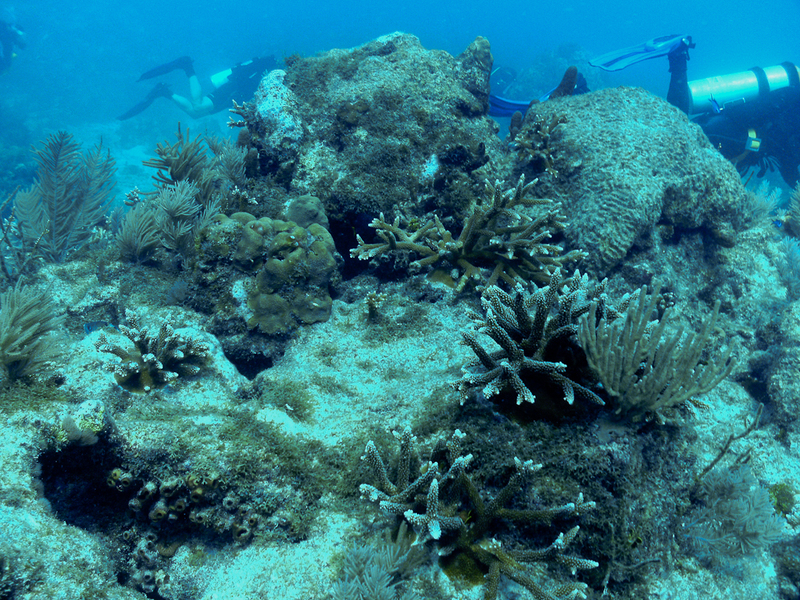 Below are photographs of the coral colony I have sponsored. Visit the CRF Website to adopt your own coral. I hope to make another trip to Key Largo and participate in one Foundation’s Community Based Programs to learn more about the program and visit the nursery. I happen to see some some re-useable shopping bags for sale at the Co-op in Lebanon. I remembered Valerie’s Friday Five about recycling and knew I should buy some. I am guilty of throwing away many shopping bags, both paper and plastic, over my life. I thought it would be a good opportunity to do more reducing and reusing. There was an info sheet with the bags that has some interesting facts. Plastic bags can take up to 1000 years to degrade and leave permenant toxins in the soil and water. Paper bags create 70% more air and 50 times more water pollutants than plastic bags. 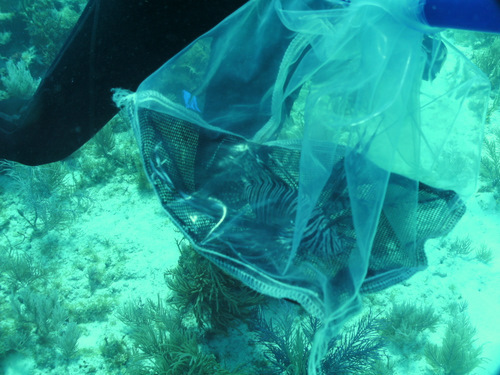 Plastic bags kill millions of sea creatures a year. The US uses 14 million trees and 12 million barrels of oil per year in the manufacture of shopping bags. The US uses approximately 100 billion plastic and 10 billion paper bags each year. Less than 5% of bags are recycled nationally. This seems to be an easy way to reduce my environemntal impact. I discovered they hold more than plastic bags. The Co-op also give you five cents off your bill per bag.